Those who remember Jerusalem in its splendor have called it the City of Gold. It is a city remembered for its glorious past - but with no future. Instead of dealing with the present, people remain involved in the past. This is what stands in the way of Jerusalem’s survival. 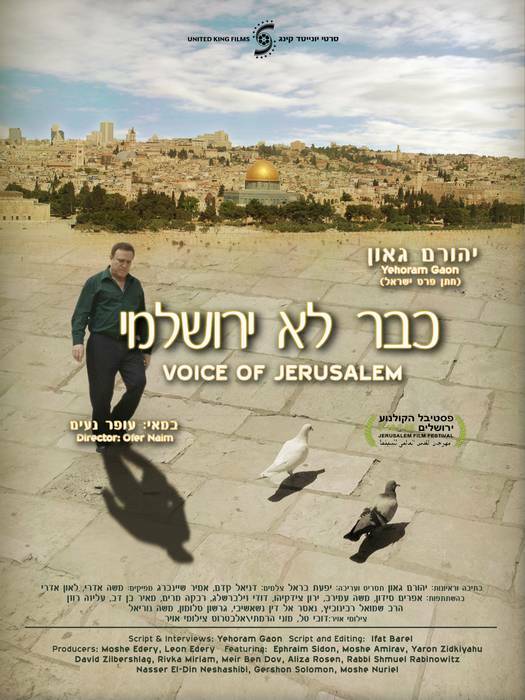 Thirty-six years after the movie “I AM A JERUSALEMITE”, Yehoram Gaon, who made that movie and is associated with Jerusalem more than anyone else, sets off to find the Jerusalem he left behind, a Jerusalem with marks and bruises and many too many scars. Are the nostalgic songs of yesteryear still relevant today? What happened to “Jerusalem of Gold”? Is there any hope or solution to the problems surrounding Jerusalem? Which of the three religions should have the right to control Jerusalem? Should Jerusalem be the capital city? Maybe all that is happening in Jerusalem stems from the ”Jerusalem Syndrome” that causes one to lose touch with reality and ones stability. Did Israel and Jerusalem’s leaders suffer from this syndrome as well? This movie tries to answer many of these questions by talking to a number of people from various walks of life and through the many songs sung longingly about the city. A partial list of those who took part in making the film includes: Yehoram Gaon, Ephraim Sidon, Moshe Amirav, Aliza Rosen, Meir Ben Dov, Dudi Zilbershlag, Rabbi Shmuel Rabinowitz – Rabbi of the Wailing Wall, David Croinker, Rivka Miriam, Yaron Zidkiyahu and Nasser El-Din Neshashibi.